A Catholic worshiper carries her daughter as Archbishop Pizzaballa (not seen), apostolic administrator of the Latin Patriarch of Jerusalem, leads the Christmas Midnight Mass in Saint Catherine's Church at the Church of the Nativity, Dec. 25, 2016. The Palestinian Authority is hosting a throng of visitors for Christmas celebrations in the West Bank town of Bethlehem. Thousands of pilgrims from around the world flocked to Manger Square in Bethlehem to celebrate Christmas. There were longs lines at the ancient Church of the Nativity, as the faithful waited to visit the grotto where Christian teaching says Jesus was born. 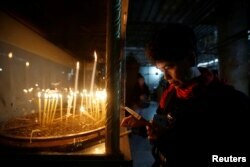 A visitor lights a candle inside the Church of the Nativity on Christmas in the West Bank town of Bethlehem, Dec. 25, 2016. Laura Gaudio came all the way from the U.S. state of Ohio. Palestinian boy and girl scouts kicked off the celebrations on Saturday evening — Christmas Eve — with a festive march through Manger Square. The marchers carried Palestinian flags as they passed a giant Christmas tree decked out in gold, in front of the ancient Church of the Nativity. Palestinians watch a performance by Christian scouts at Manger Square, outside the Church of the Nativity in the West Bank City of Bethlehem, Dec. 24, 2016. Inside the 4th century church on Sunday, pilgrims waited in long lines to visit the Grotto of the Nativity, the spot where Christian teaching says the baby jesus was born. Visitors walked down a narrow cobblestone stairway into the crowded, stuffy cave, its ceiling blackened from the smoke of oil lamps burning over the centuries. Palestinian President Mahmoud Abbas congratulates Archbishop Pierbattista Pizzaballa, apostolic administrator of the Latin Patriarch of Jerusalem, during the Christmas Midnight Mass in Saint Catherine's Church at the Church of the Nativity, in Bethlehem, Dec. 25, 2016. For believers, the grotto connects the Christian faithful, from the distant past to the present. Latin clergies gather in the Grotto at the end of the midnight mass in Saint Catherine's Church where Christians believe the Virgin Mary gave birth to Jesus Christ, in the adjacent Church of the Nativity in Bethlehem, Dec. 25, 2016. In the Holy Land, religion and politics are never far apart. 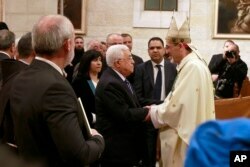 For the Palestinian Authority, which hosted the event, it was another Christmas under Israeli occupation. But Bethlehem Mayor Vera Baboun insists that it is still a merry Christmas. While it is a biblical journey for pilgrims, it is impossible to escape the current realities of the Israeli-Palestinian conflict. In order to travel from Jerusalem to Bethlehem, visitors have to cross through Israel’s border wall at the entrance to the city. The “security barrier,” as the Israelis call it, was erected more than a decade ago to stop Palestinian suicide bombers from infiltrating the Jewish state. In the spirit of the season, though, people in this little town still hope for better days.